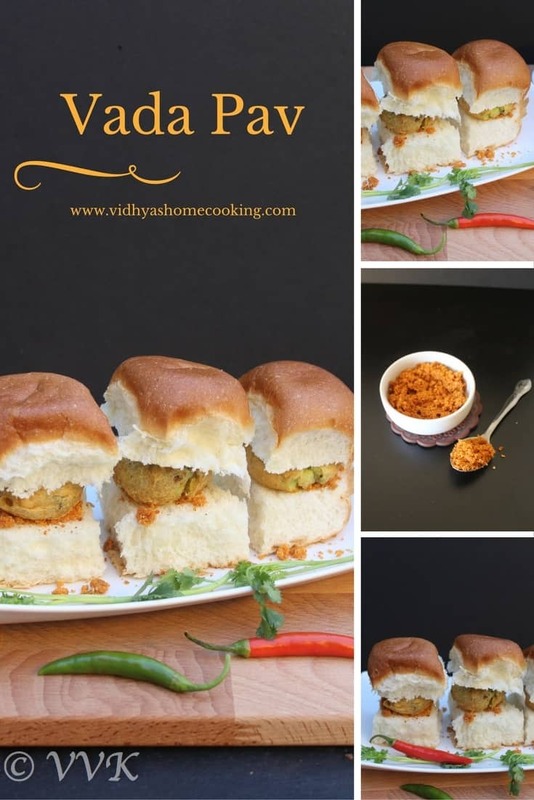 Today I am presenting another popular street food recipe – Vada Pav. It’s our own Indian burger. In my opinion, Dabeli falls under sandwich and Vada Pav falls under burger. Basically it’s the Batata Vada served with dry garlic chutney in a Pav bun or any sweet buns. You can include other condiments/toppings and chutneys too, but I just went with the dry garlic chutney and green chutney. 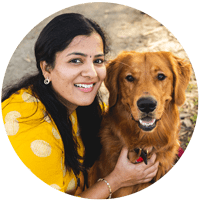 I have already explained about our IMC stall experiences in the Avocado Lassi post. In one of the stalls we had this Vada Pav and they served just with dry garlic chutney. It was mess free and easy to grab and gobble. I really liked that idea and went with the same style, err included the green chutney though. I spiced up my Batata Vada with garlic-ginger-cilantro chutney and added tamarind paste in my garlic chutney to balance the taste and also to get all the flavors. When I serve for kiddo, I add some sugar on top of garlic chutney and also spread some ketchup on the sweet Hawaiian buns that I get from Costco. 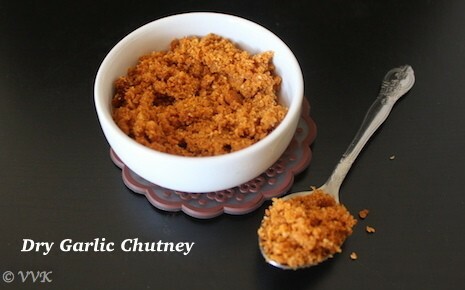 This garlic chutney recipe serves for about 8 to 10 vada pavs. 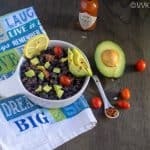 But you can double the proportion and prepare in bulk too. 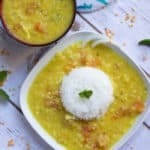 As I mentioned above this goes well with idlis and dosas too. Once the oil is hot, add the chopped garlic and roast for 2 to 3 minutes in medium heat. Now add the other ingredients except tamarind paste and roast for another 3 minutes. Let it cool and dry grind it along with tamarind paste. That’s it. The dry garlic chutney is ready. Slit the Pav buns into two. Heat the tava and add butter or ghee or oil and toast them slightly. 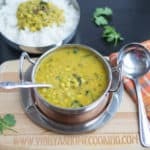 Now spread about 1 to 2 tsps of the dry garlic chutney on one side and green chutney on the other and keep the Batata Vada on either one side and close it. Press it slightly and that’s it. Vada Pav is ready. Vada Pav along with Lassi is filling combo. I have used small amount of garlic. But for this proportion you can go up to 10. 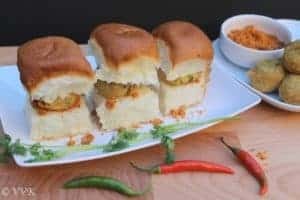 You can arrange Vada Pav as per your liking by including other chutneys too. 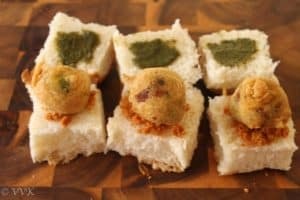 A popular Indian street food recipe prepared with yummy potato fritters or popularly called as batata vada and spiced up with dry garlic chutney and green chutney. Vada pav is one of my fav!..I still remember the first time I ate this..so nicely done Srividya. :-) I like it too. Thanks valli. 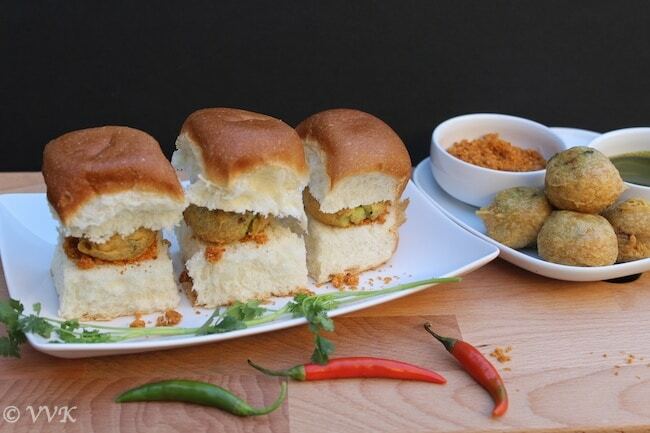 Vada pav with garlic chutney & green chilly is a yummy dream! What a tempting vada pav. Looks awesome. Vada pav looks so sinful . Love the entire setup. Vada pav is my favourite snack. I love it in any fprm . with or without chutney this one is tempting me to make some vada pav soon. One more classic street food from you and it looks tempting. Adopt me please, you are tempting me everyday to make some chaat foods and am sitting idle here. Couldnt stop myself drooling over those alluring vada pav. ha ha ha.. sure.. come over anytime. Let’s have a gala time. Delicious to look at. Stunning photography !!! Even though I made so many versions of vada pav , I always drool looking at this amazing street food. 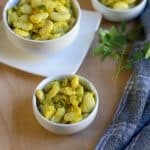 I like the garlic chutney version, it is different. I guessed it right. Amazing vada pavs. 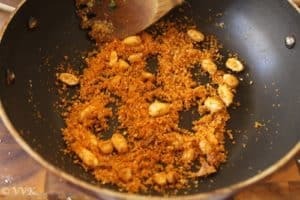 I haven’t tried the dry garlic chutney. Must try your version as it sound so yum.. It was pretty obvious na.. ;-) Thanks gayathri. You have tempted us all through the week with the street food. Thanks for the virtual treat! :-) Thanks Harini. More to come. 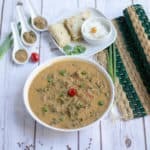 Another mouthwatering and popular chaat! !